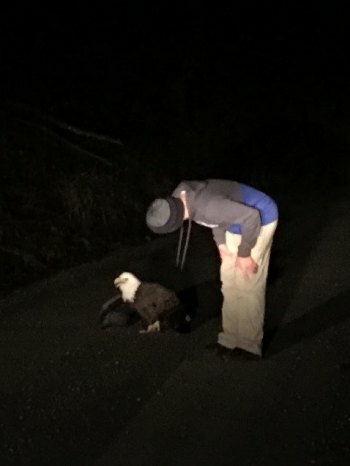 As the bus got closer, she knew immediately it was a bald eagle—and it was blocking the way. Standing more than 2 ½ feet tall, the eagle did not respond when she and Greg tried to shoo it out of harm’s way. Seeing no other option, they decided to rescue it in the hopes of connecting with a wildlife rescue organization. Using a student’s jacket to cover the large bird, Greg was able to gently carry it onto the bus. When the bus came down off of the mountain and the cell service icon finally appeared on several students’ cell phones, Cindy called the state police. She was transferred to the local 911 call center of Randolph County whose staff members knew exactly who to call—Jo Santiago of the U.S. Forest Service. A wildlife biologist, Jo has been rescuing ill, injured, or orphaned birds of prey for over 28 years. Several hours later, the bird was in Jo’s care. After examining the female eagle, Jo found no obvious injuries but did notice the bird was having great difficulty breathing. Luckily, she was able to reach Dr. Jesse Fallon, a raptor specialist veterinarian with the Avian Conservation Center of Appalachia. The over-the–phone triage led Dr. Fallon to suspect the bird had been poisoned. Sadly, the eagle died while Jo was administering electrolytes. The raptor’s massive wingspan reached about 7 feet. The next week, Jo contacted Cindy to let her and the students know the unfortunate outcome of the rescue. 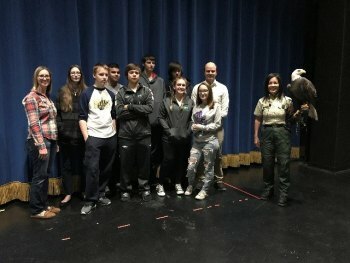 As a way to thank them for their efforts, Jo offered to come see them and discuss her work with the Forest Service International Program's Migratory Raptor Program. The presentation features live birds of prey—including a bald eagle named Freedom. Freedom, 18-year-old raptor, is on loan to Forest Service International Programs from the American Eagle Foundation. Although he is non-releasable due to a permanent injury, Freedom inspires awe and a connection to nature in everyone who sees him. The Byrd High School students were no exception to this when they saw Jo’s impressive presentation in December. They were excited to share that their school mascot is the eagle—and even more thrilled to meet Freedom. Although they were sad that the female eagle they tried to rescue had not survived, the students’ felt their experience was unforgettable.